Insulin is primarily used to keep sugar level at normal state. It is primarily used to regulate the metabolism in the body. Insulin patch pumps are device that are used to transfer the insulin through the adhesive present on the patch tube. It is an automatic device which is small and light in weight. It is digital patch pump that can be monitored using touchscreen and bluetooth. It is relatively a simpler method of getting insulin in comparison to the traditional method of insulin. Insulin patch pump enables multiple injections. It is safer and easy to use on the account of its convenient design framework. It provides required level of the glucose in the blood vessel and helps to easily monitor it. The global insulin patch pump market is anticipated to expand at a significant CAGR during 2018-2027. It is projected to reach significant market size by 2027. The growing population suffering from diabetes coupled with the increasing demand for the technologically advanced equipment is anticipated to increase the growth of the global insulin patch pump market over the forecast period. The global insulin patch pump market can be segmented on the basis of insulin type and end-user. On the basis of insulin type, it is sub-segmented into bolus, basal and basal-bolus. On the basis of end-user, it is sub-segmented into online pharmacies, hospitals, retail pharmacies and private clinics. 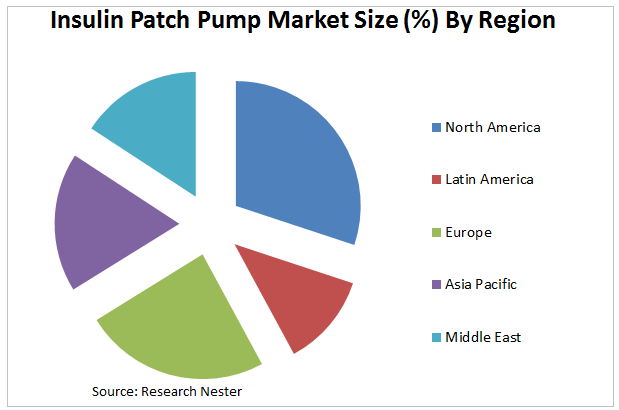 Hospitals are anticipated to be the largest sub-segment for the global insulin patch pump market on the account of increasing pool of patients coupled with the availability of technologically developed equipment. However, online pharmacies are anticipated to be the fastest developing sub-segment for the global insulin patch pump market. The online pharmacies offer wide range of products that caters to the evolving and unmet needs of customers. Additionally, the different buying options are also anticipated to reduce the actual cost associated with equipment. The increasing number patients suffering from diabetes is anticipated to be the major growth driver for the global insulin patch pump market during the forecast period. The rise in the per capita income of the population is encouraging the population towards using efficient technologies .The growth in the online pharmacies supports the population towards better selection of the devices and is anticipated to upsurge the global insulin patch pump market. However, the complex mechanism in the insulin device makes it less user friendly and is anticipated to restrain the global insulin patch pump market. The other factor that hinders the market growth of the insulin patch pump is that when device is attached to the skin with adhesive it leads to skin irritation.